Today, the Chief Officers regret to announce the passing of Lt. John Ford. Lt. Ford is a 61 year veteran of the fire service. FF Ford began his service as a Junior Firefighter at the Brandywine Fire Company in Coatesville, and served there until they closed. His family was active in the Brandywine Fire Company and when they voted to allow junior firefighters, John was the first to join. He has been serving in the fire service ever since. In 1970 he moved to Parkesburg buying a 100 year old home on W. Main Street, with his wife, Gloria. 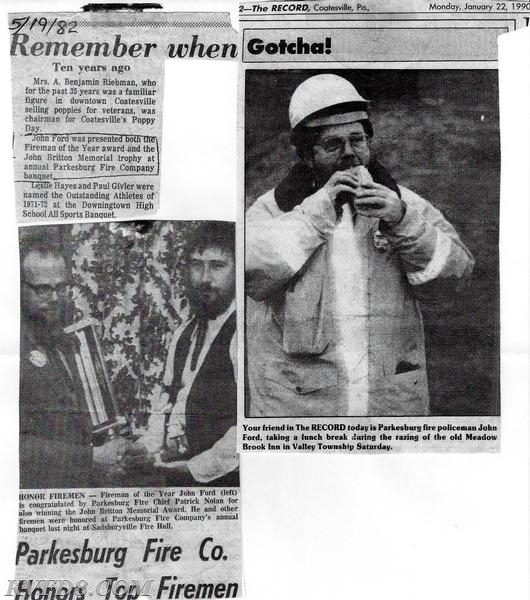 That year John joined the Parkesburg Fire Company where he served as a firefighter, a driver, an ambulance aide and now with KVFD as a fire police officer. He has been honored several times over his career as Fireman of the Year and for other recognition. 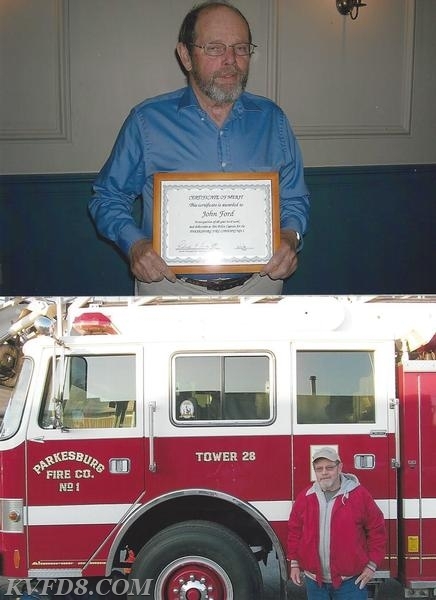 John retired after working 37 years at Cigas Machine Shop in Coatesville. He was married to Gloria for 57 years. They have three grown children. Lt. Ford said,"No fires really stand out. They are all bad when people are killed or hurt, and lose property. I joined the fire company years ago because I enjoy helping other people, and I still want to help as I can." He laughs while recalling how many years ago,he was selected to be the lucky one because he was the smallest, and lowered down a well to rescue a cat. He said he enjoyed all parts of the fire service except sometimes the "politics" and how regulated it has become. He likes serving with the other fire police officers but said jokingly "they get on me a lot, but it's all in fun." Past chief Tim Reynolds said, "There are things about John Ford most members don't know. John is one of our members that has more training and experience then some of our current members in firefighting and rescue, and is always ready to learn more." He has been a Firefighter, Fire Line Officer, Trustee, Fire Police Lieutenant and Fire Police Captain in the Parkesburg Fire Company No.1." All agree that John shows up at the fire house ready to help in anyway he can, participates in training, fund raisers, special events and is always ready to help at calls any way he can. John is not only a dedicated Department member but a dedicated husband, father and family man. Tim Reynolds said, "I kid John that he's older then dirt and can't remember what he had for breakfast but he is a good friend, an asset to the Department and just a good Ace. RIP John." Lt. Ford doing his traffic dance on Rt.#10 at a crash. Lt. Ford giving Santa his wish list after the 2013 Parkesburg Christmas parade. John and I serve together a fire police, I will remember forever...I will pray for all of us say .....God is love..